After what seems like a long break from blogging while we settled into our new home, we are back, with the news that little baby F is one! And what better way to start than sharing her birthday celebrations. 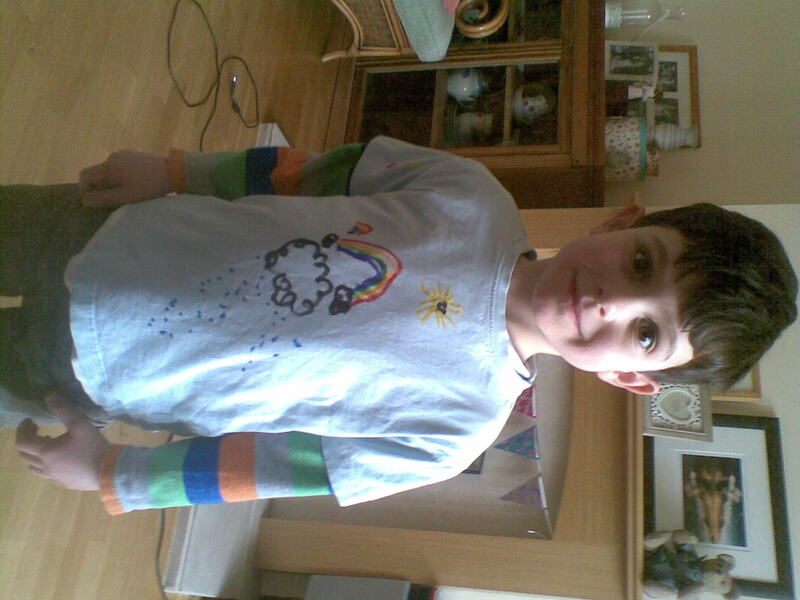 The theme was decided by L and N. We have been learning about the weather, and they have been captivated by rainbows. 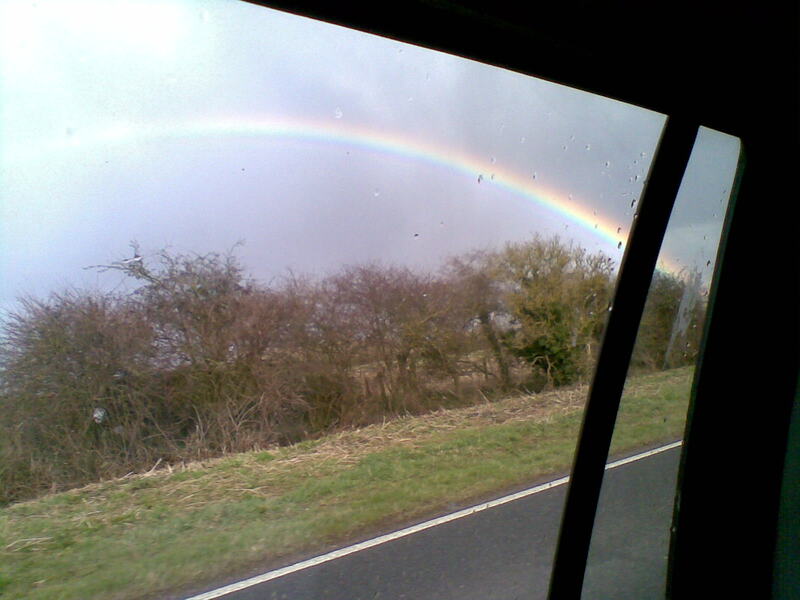 We have made our own tiny rainbows with a glass of water and a torch like this, and by lucky coincidence seen this brilliant rainbow in the sky. 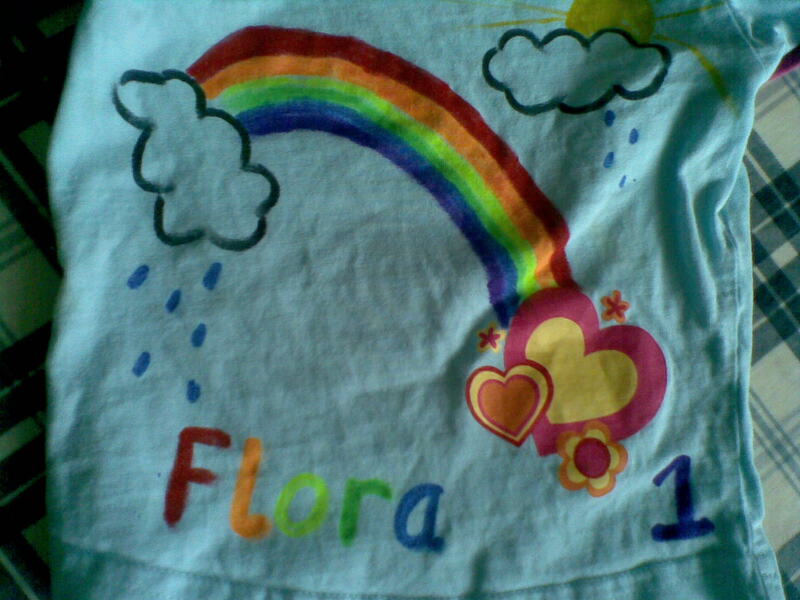 And Mummy had fun making a special one for F! 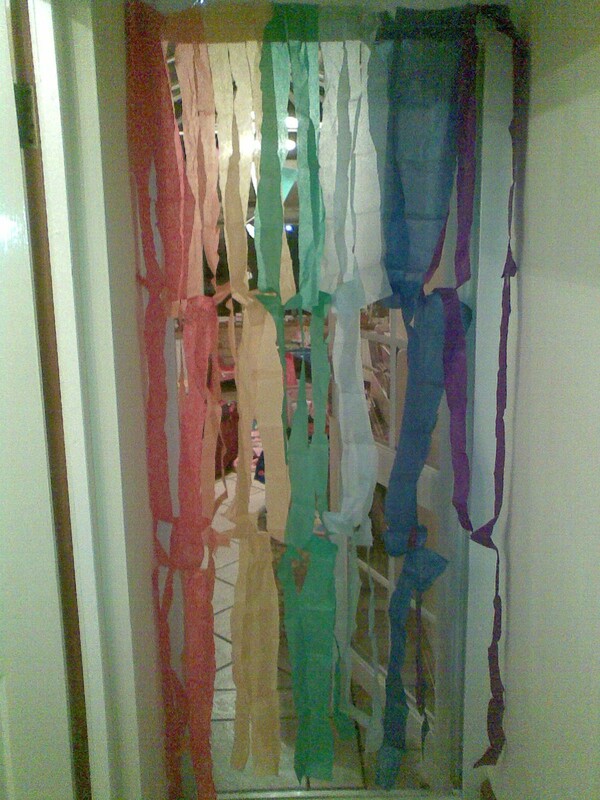 A crepe paper curtain – literally just strips of rainbow coloured paper sellotaped to the door frame. 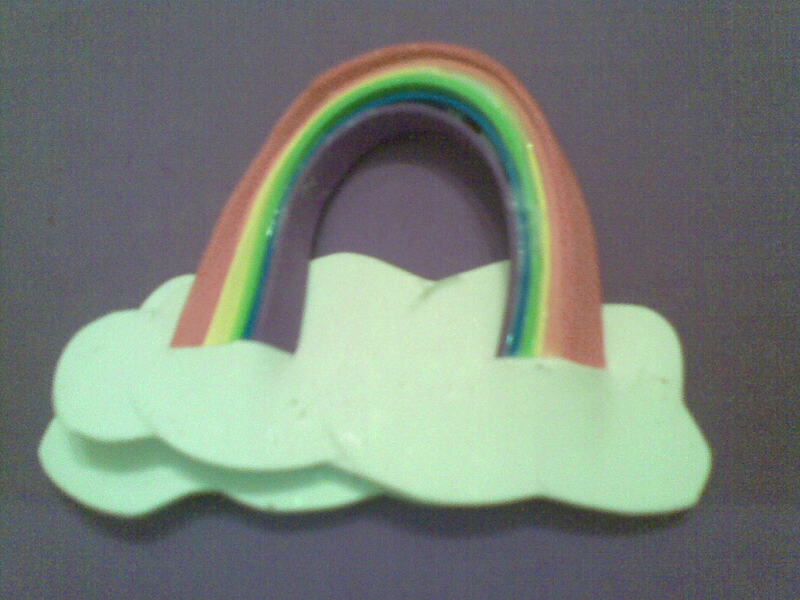 A rainbow banner – the letters of F’s name cut out of craft foam and threaded along a string. 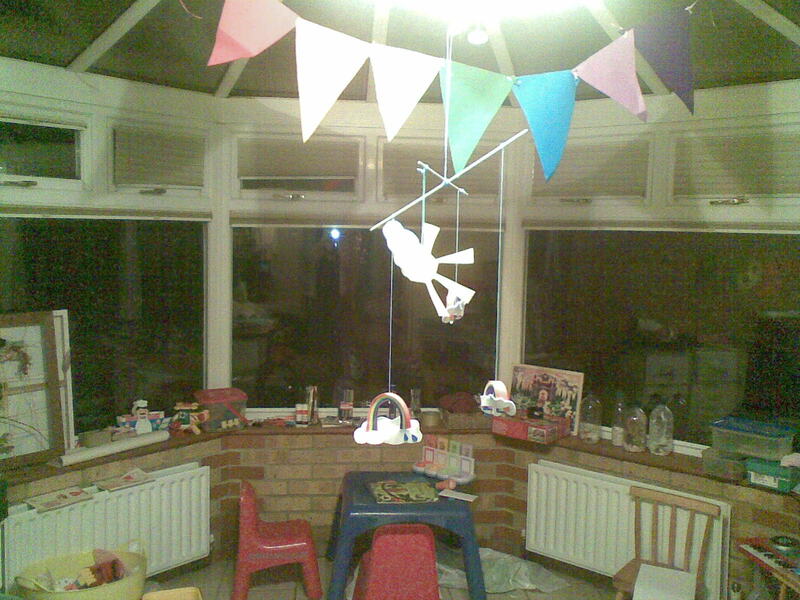 A rainbow mobile – made of craft foam, PVA glue, and threaded onto yarn using a needle, and attached to two bamboo skewers tied together in a cross shape. 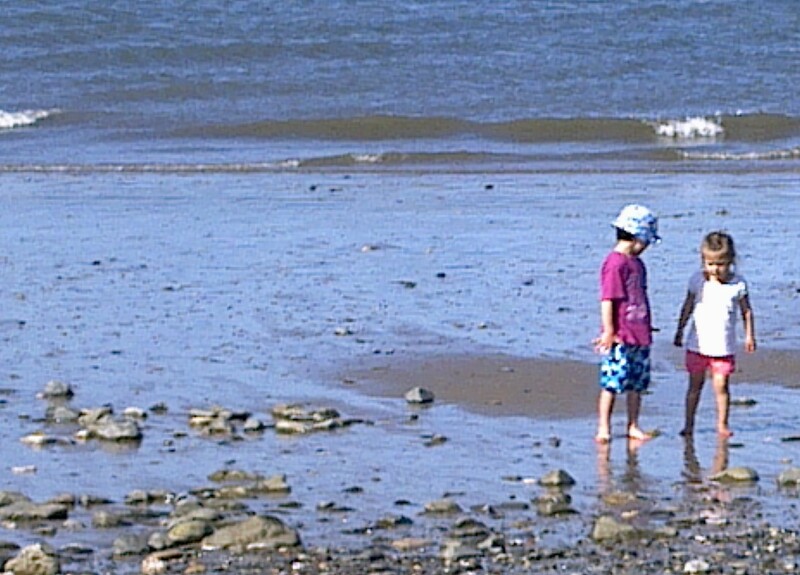 The “party” itself was quite low key – just ourselves and Nana, who was visiting. 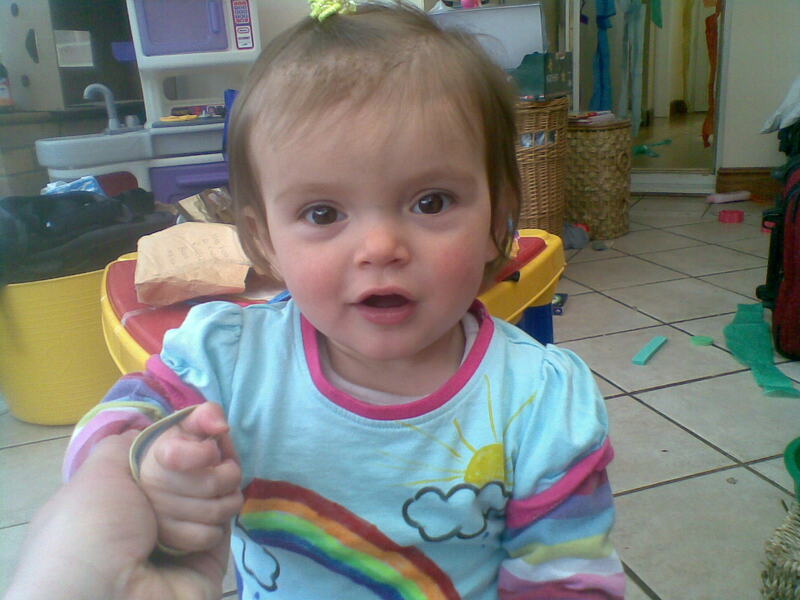 I wanted to be able to focus on F, and give her attention rather than entertaining people – also, we thought she would probably be overwhelmed by lots of people. 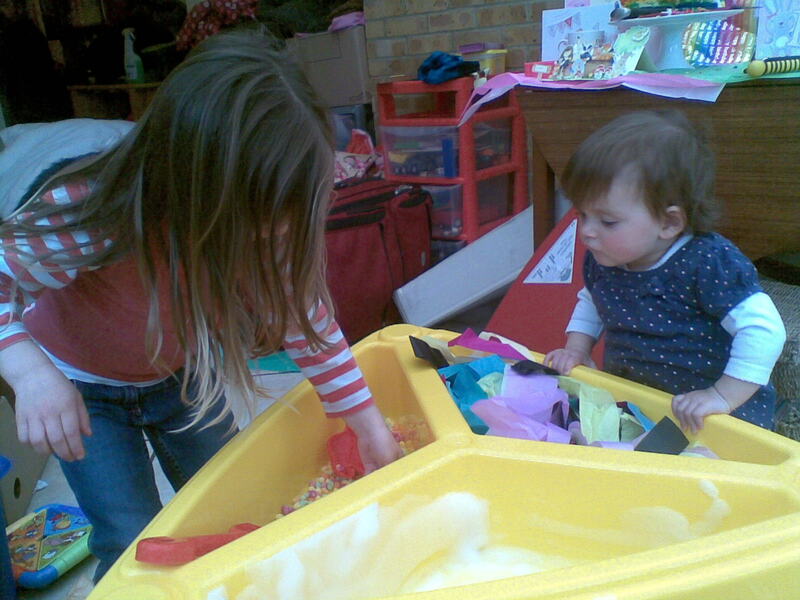 So we had a trip to the farm, and a tea party with lots of colourful and sensory things to explore. 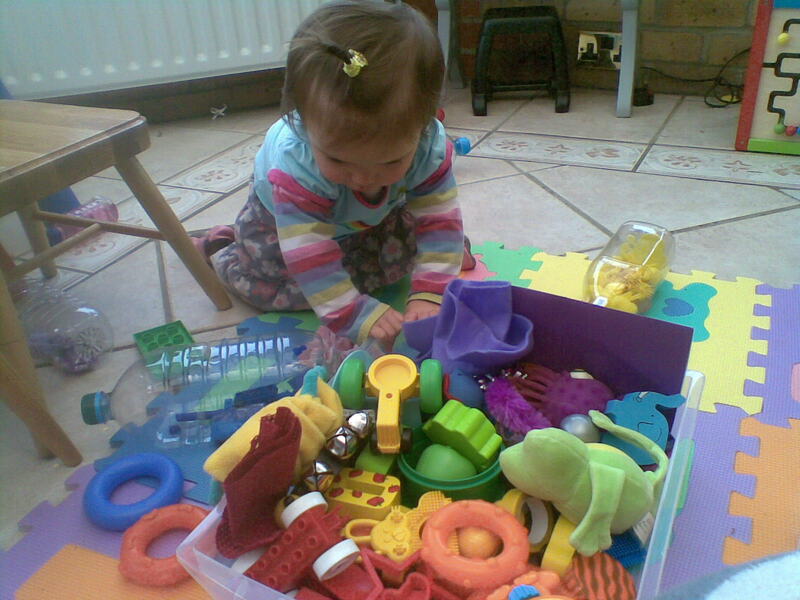 The toy tray was very easy, and brilliant in that it gave a new lease of life to toys that haven’t been played with for ages. 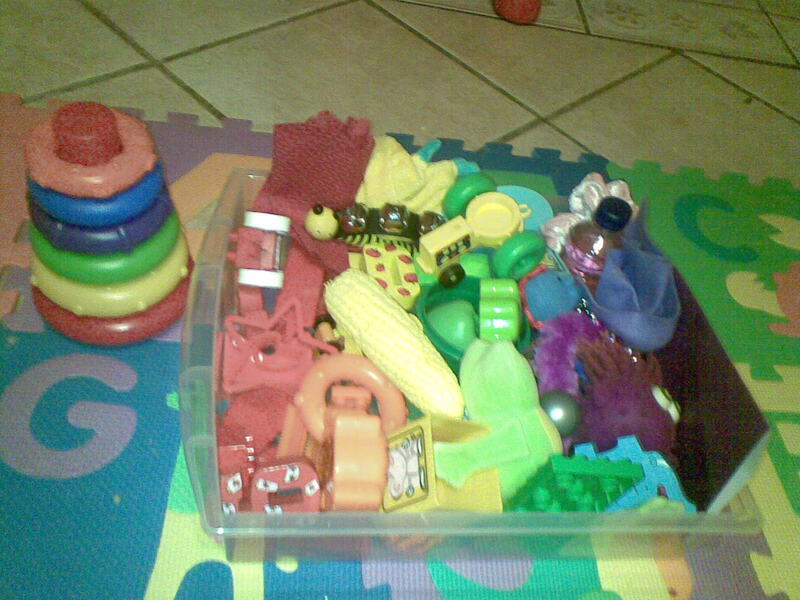 L, N and I sorted toys that were safe for F to explore, into the colours of the rainbow, and arranged them in an empty drawer. 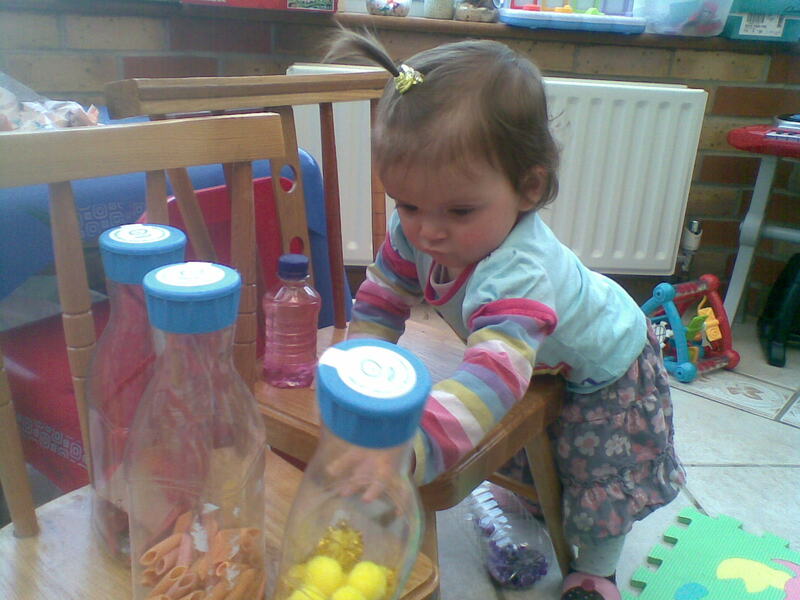 We also put together some rainbow discovery bottles. 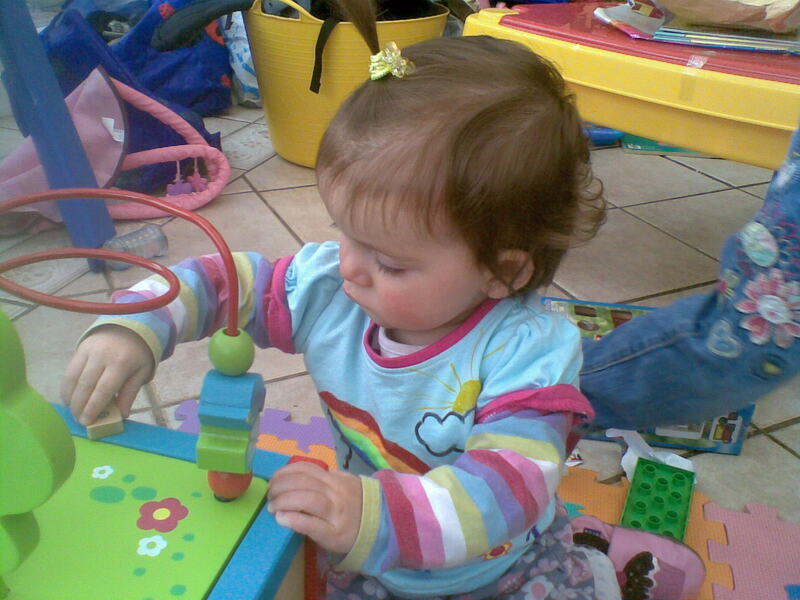 The beauty of this was allowing F to investigate some of the forbidden objects that fascinate her, in a safe way – hairbands, pipecleaners, pens, paperclips, beads, coloured rice… At first I found it hard to decide whether to group things by type (ie. 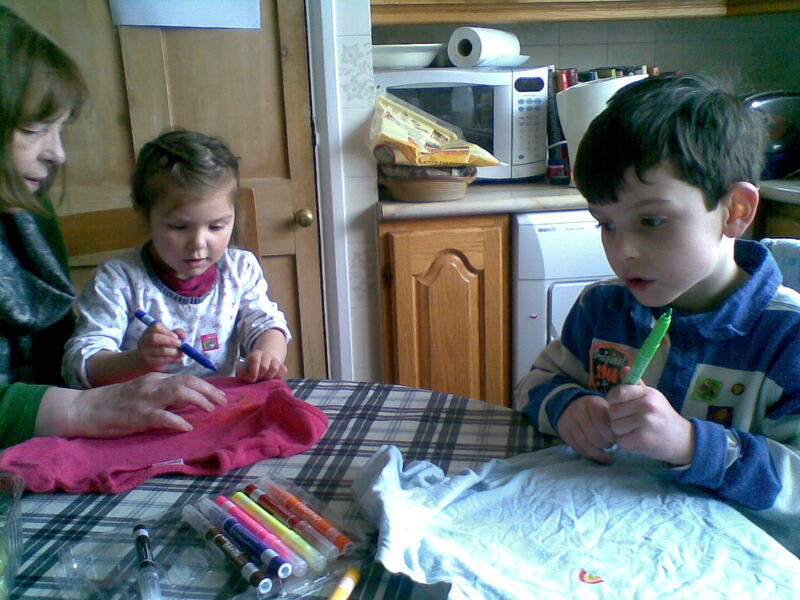 a bottle of rainbow rice, a bottle of multicoloured pipecleaners etc) or to group them by colour. I decided on the latter when a friend pointed out that we could then use them for single colour learning. Another friend suggested a final bottle with an object of each colour, which I plan to do once we’ve emptied another plastic bottle! 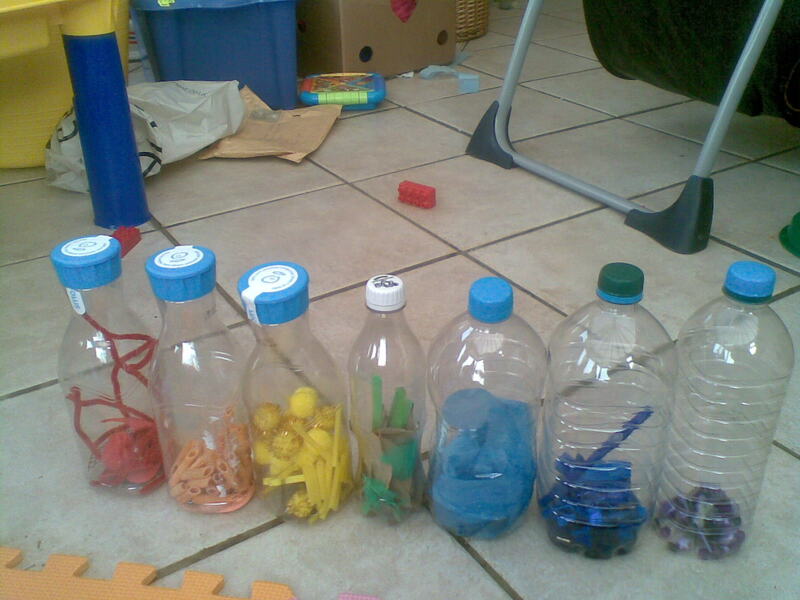 I was concerned that including a variety of objects in each bottle would be overwhelming and prevent F from focusing and investigating them fully, so I limited the number of things in each one, and tried to make the bottles different in terms of the sounds they made and the kinds of objects they contained. 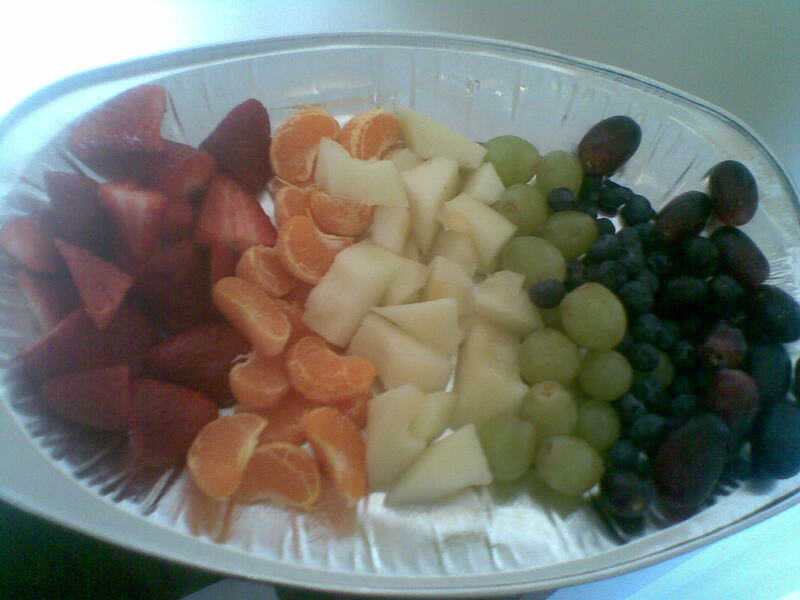 There really are infinite ways of doing this and all of them good! Violet beads and hairbands, plus a purple necklace of mine. 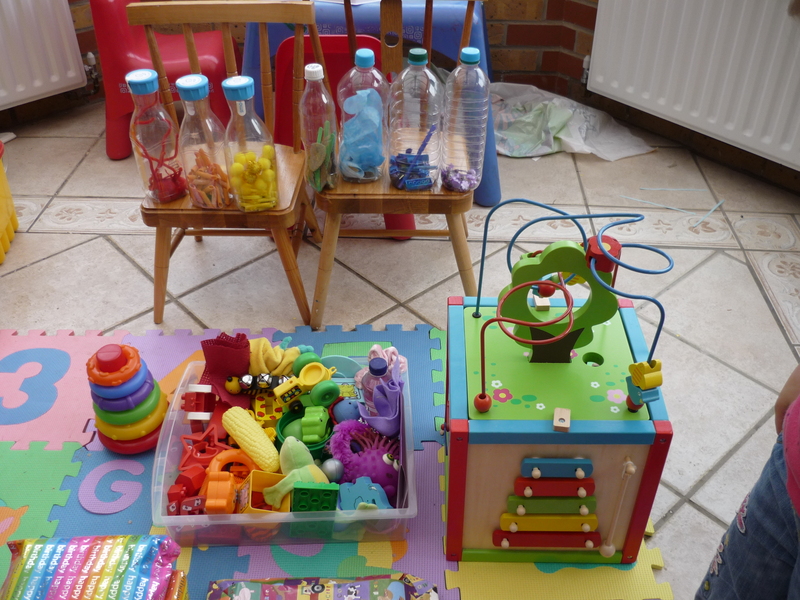 F has had great fun rolling these along the floor, shaking them, banging them…I wondered if shie might be frustrated by not being able to empty the bottles but so far she hasn’t tried (the lids are stuck down with strong glue). 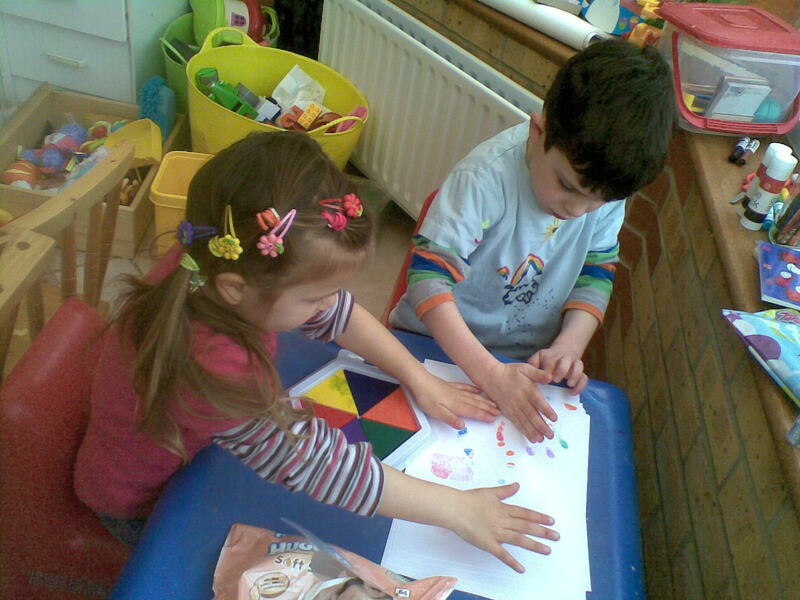 We also had rainbow handprinting (I picked up the rainbow handprint sponge from The Works). 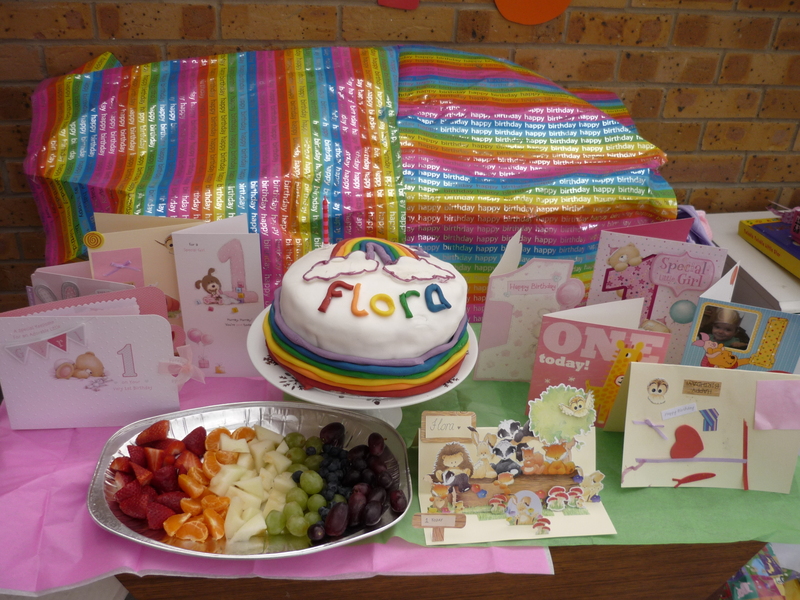 …and F received some fantastic rainbow presents, including Melissa and Doug Rainbow Sound Blocks, a large colourful activity cube, and musical instruments including a rainbow xylophone. 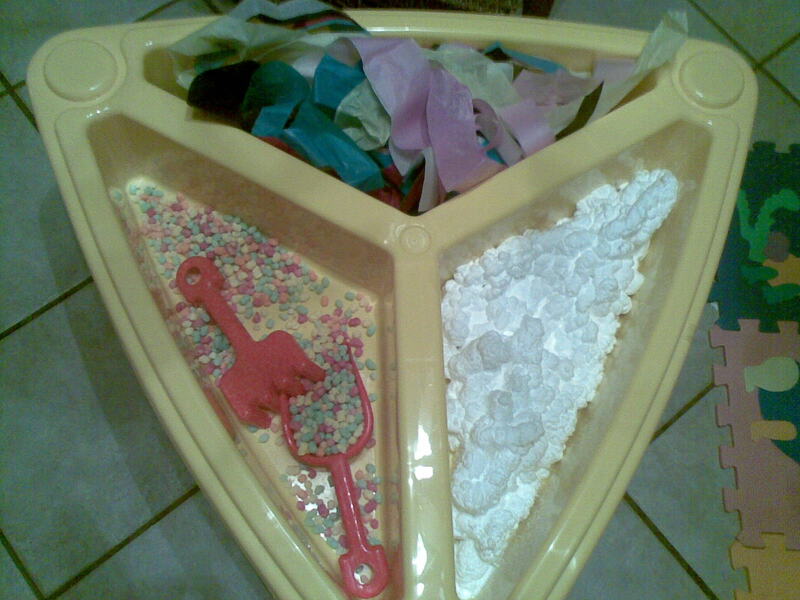 Our present to F was a sand and water table, which will never be limited to sand and water – for the birthday, we filled it with strips of coloured paper, rainbow dyed rice krispies (an alternative to rainbow rice that’s safe if eaten), and shaving foam which we later added food colouring to for marble painting. 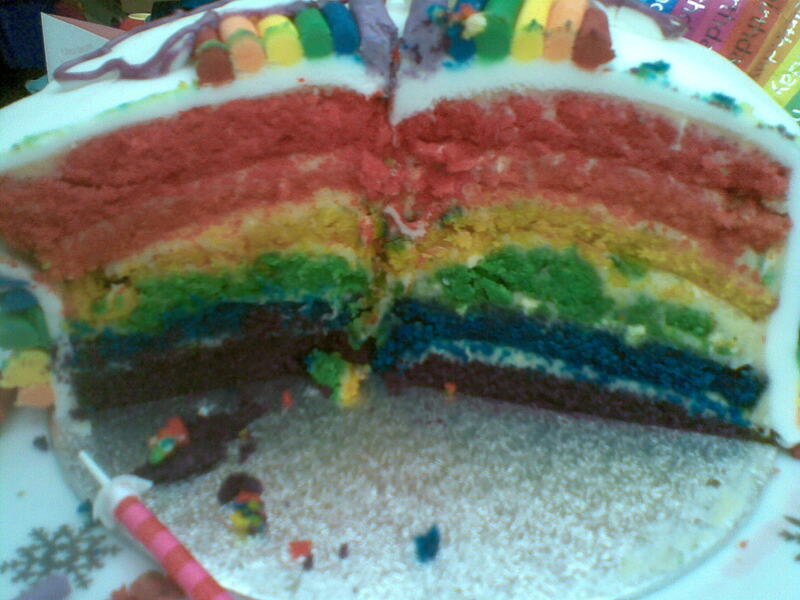 We finished up with a rainbow layer cake. 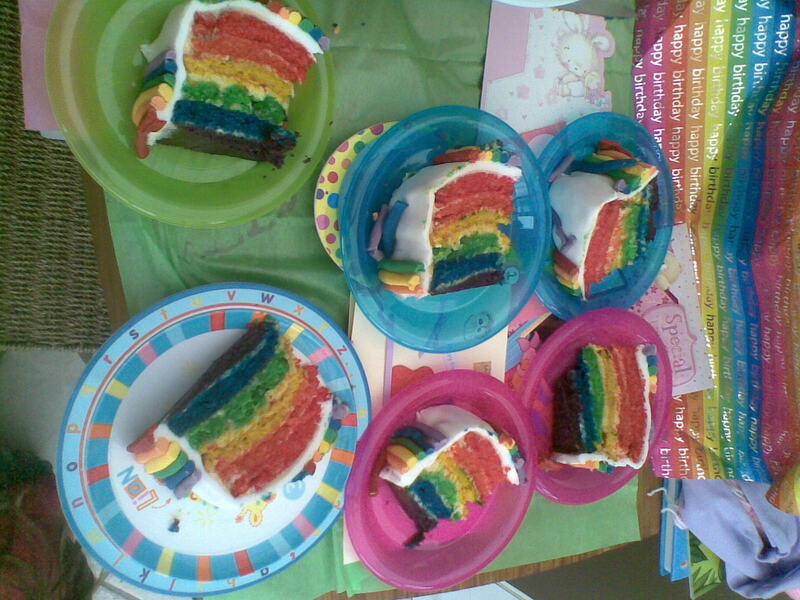 This was actually easy if time consuming, although no more so than other birthday cakes we’ve had. 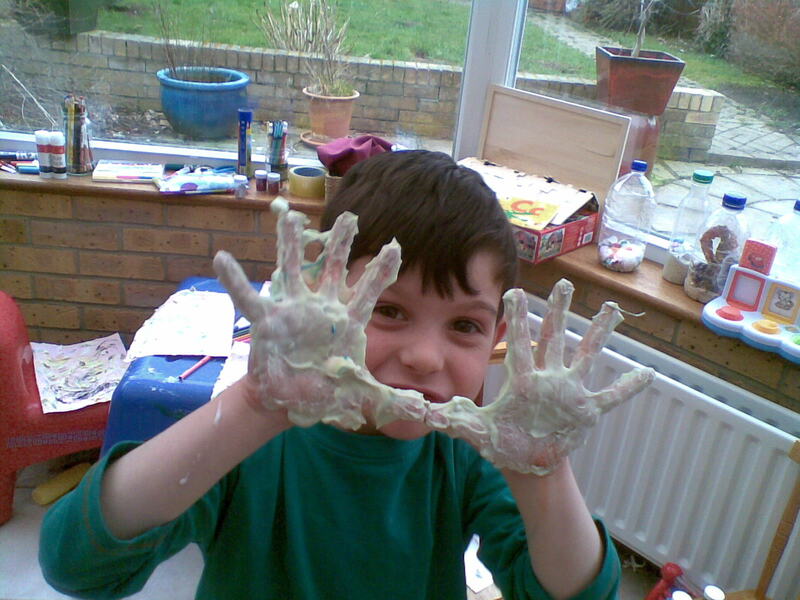 It just involved making a huge quantity of sponge mix, dividing it into separate bowls, and dyeing each a different colour using gel food colouring. 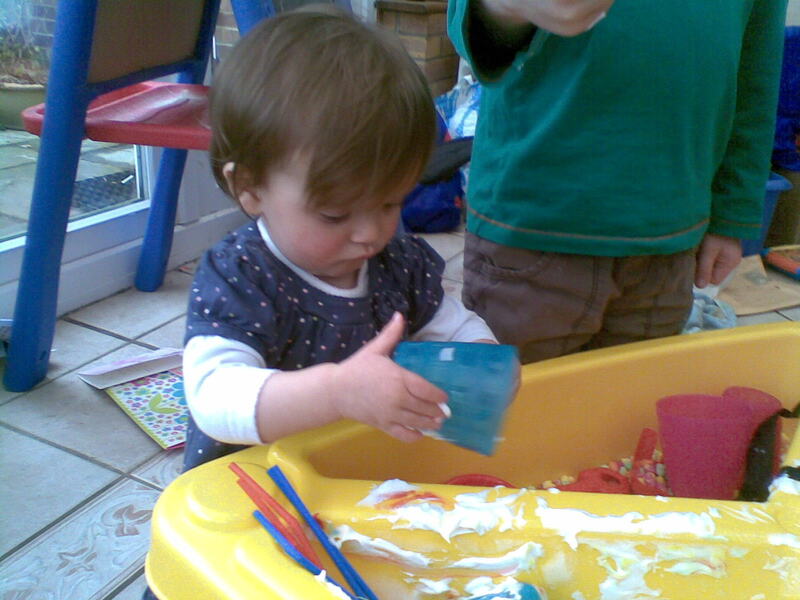 The gel gives a beautiful vivid colour with only a few drops, whereas liquid would be likely to ruin the cake batter as you’d need so much colouring. 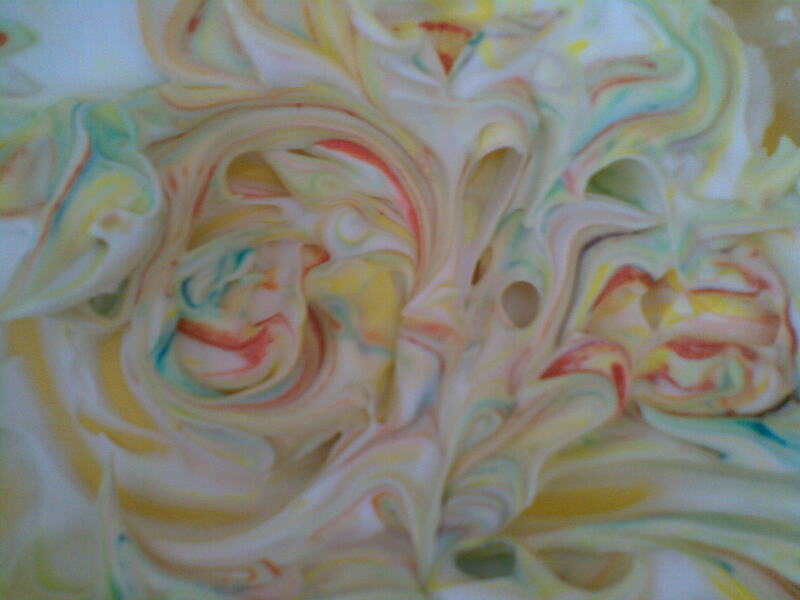 The layers are then sandwiched together with buttercream. 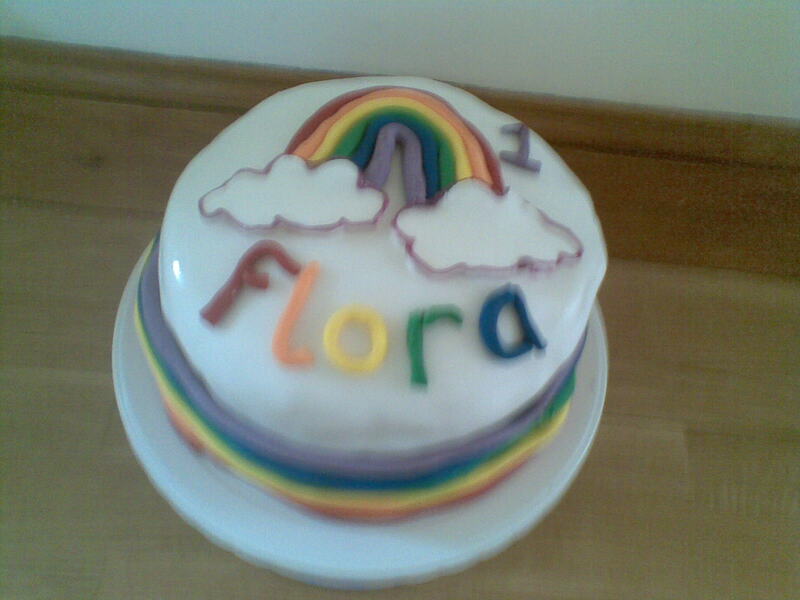 We covered ours in fondant too, as no matter how much buttercream you make, it will never be enough for this cake! 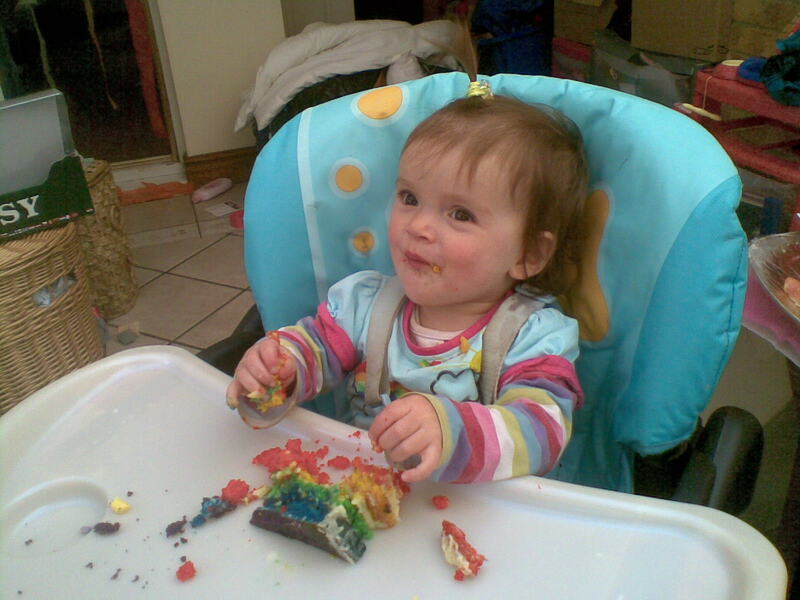 This entry was posted in Arts and Crafts, Babies, Birthdays, Special Occasions, Themed Activities and tagged first birthday, rainbow birthday party, rainbow discovery bottles, rainbow layer cake, rainbow mobile on April 14, 2013 by Kate Carre.